In the next few days, an unoccupied Chinese space station, Tiangong-1, is expected to reenter the atmosphere following the end of its operational life. Most of the craft should burn up. ESA is hosting a campaign to follow the reentry, conducted by the Inter Agency Space Debris Coordination Committee (IADC). The 13 space agencies/organisations of IADC are using this event to conduct their annual reentry test campaign, during which participants will pool their predictions of the time window, as well as their respective tracking datasets obtained from radar and other sources. The aim is to cross-verify, cross-analyse and improve the prediction accuracy for all members. 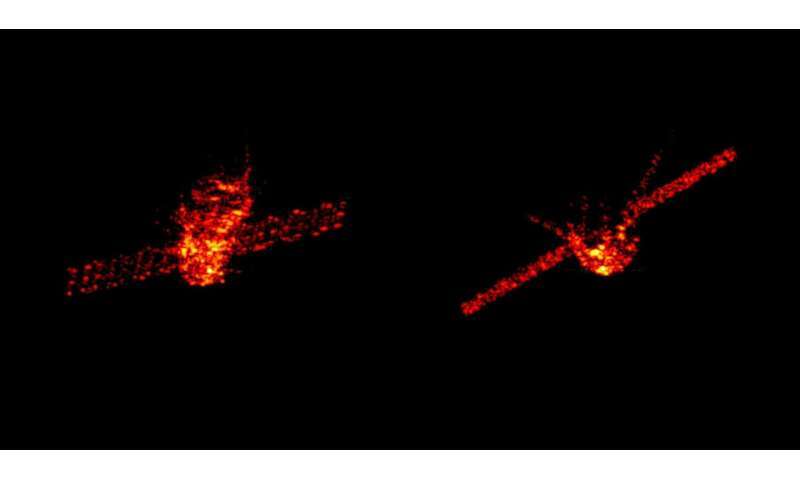 These radar images (the image above is a composite of two separate images) were acquired last week by the Tracking and Imaging Radar system – one of the world's most capable – operated by Germany's Fraunhofer FHR research institute at Wachtberg, near Bonn, when the craft was at an altitude of about 270 km. Data and images from the radar are being pooled as part of the IADC campaign. The spacecraft is 12 m long with a diameter of 3.3 m and had a launch mass of 8506 kg. It has been unoccupied since 2013 and there has been no contact with it since 2016. The craft is now at about 200 km altitude, down from 300 km in January, in an orbit that will most likely decay sometime between the morning of 31 March and the early morning of 2 April. Owing to wide variations in atmospheric dynamics and the break-up process, among other factors, the date, time and geographic footprint of the reentry can only be forecast with large uncertainties. In the history of spaceflight, no casualties from falling space debris have ever been confirmed.